In simple terms, a developer proposes a new development by submitting a PAN (Proposal of Application Notice) which gives local people the heads up that someone has plans for their local community. These plans are exhibited at the PAN exhibition, which takes place in a local community facility, giving locals a chance to see & learn a bit more about the proposals. At this point the community simply needs to understand what is at stake in the development. Next off, the developer submits a planning application (PPP) in which he outlines the proposals in more detail, and locals are given 6 weeks to comment on them. At this point, the community needs to take action and comment on the proposals. Since developers rarely consult local communities before submitting an application – being more interested in their commercial gains than in local democracy – their comments are often opposed to the proposals, in that they probably won’t meet the needs of the local people. Then peoples’ comments go to the Planning Dept at CEC (City of Edinburgh Council), firstly to the professional planners, and subsequently to the elected councillors on the Planning Committee, who will decide whether to allow or refuse the application. 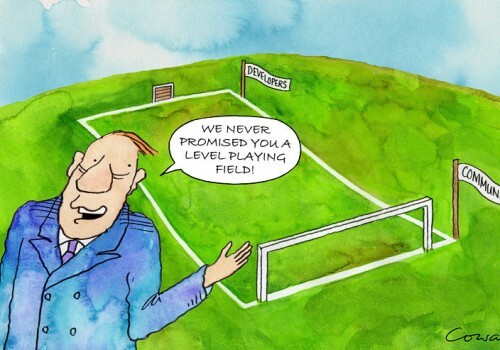 The professional planners make recommendations to the councillors, who will often follow their advice, but not always. The more comments that the City of Edinburgh Council receives on the proposal, the more influence the community stands to have over the development. If the professional planners and the public both oppose the proposals, the councillors may well refuse the application. So in theory, the professionals do their bit, then the elected councillors chip in their say, and we the public also have our own comments – and so democracy prevails? If councillors recommend a refusal, the developer can subsequently appeal to the Scottish Government Reporter. This person will unilaterally decide whether the development will go ahead or not. This person is not elected and does not answer to anyone – he/she is the final authority on the matter and no appeal can be made a Reporters decision. Usually developers will appeal to the Reporter, and quite often they do get their way – despite all the arguments of the professional planners, and of the democratically elected councillors, and not forgetting the actual communities that will have to live with the planning decision. What’s more, the same right of appeal is not granted to communities. This means that much development ends up being railroaded through an impotent planning system that has become a facade of democracy and accountability – aka “planning by appeal”. The planning system is not working and needs to be rebalanced in favour of genuine community consultation. One way of ensuring this would be to allow a Community Right of Appeal (CRA). This feature has been in operation in Eire for many years, and simply levels the planning playing field to ensure that more acceptable proposals are submitted by developers in the first place. For more on this, and other ideas to re-democratise the planning system, go to Planning Democracy – see also its Facebook page.